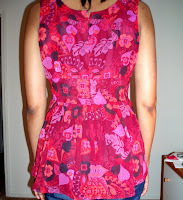 Pattern Description: Sleeveless top with empire waist, bust gathers, shoulder and waist pleats, with self-fabric tie. Were the instructions easy to follow? Once you get past the shoulder pleat section, the rest is cake. Since I already made this in the dress version, I didn’t have any problem figuring them out. I would say that the instructions are easy, but the pleats were a pain. That’s why this top was a UFO for so long. I didn’t feel like bothering with the pleats. I used some black fusible interfacing this time around for the shoulder strap section. It’s looks better than the standard white interfacing with this magenta fabric. What did you particularly like or dislike about the pattern? 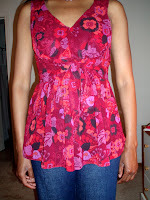 I love the feminine flirtiness of this top! Nothing to dislike. Fabric Used: Left over fabric from this same pattern’s dress that I made in September 2007. Pattern Alterations or any design changes you made: None really. I used an invisible zipper. Would you sew it again? Would you recommend it to others? I don’t think I’ll sew this again since I already have the dress and top in the same fabric. I do recommend this top though. It’s very cute and great for this summer. Conclusion: It’s a nice top. I think it’s funny that this pattern is aimed at beginners since it includes all these pleats and a zipper. I guess it’s not hard too put together. You just have to take your time to clearly mark the pleats so that they are spaced evenly. I have this pattern too. I did not sew it up last year, but after seeing your set, I’m going to put it to the front of my list of things to sew! Love yours! Very nice!I have this pattern also.I want to make but I keep wondering if I can get those pleats right on the shoulder strap.Now that I have seen yours I think I am going to give it a try!Great job!! Very cute top, love your fabric choice. Great outfit! I really like the fabric and the shape. So flattering! Great combo! These 2 pieces are lovely together!